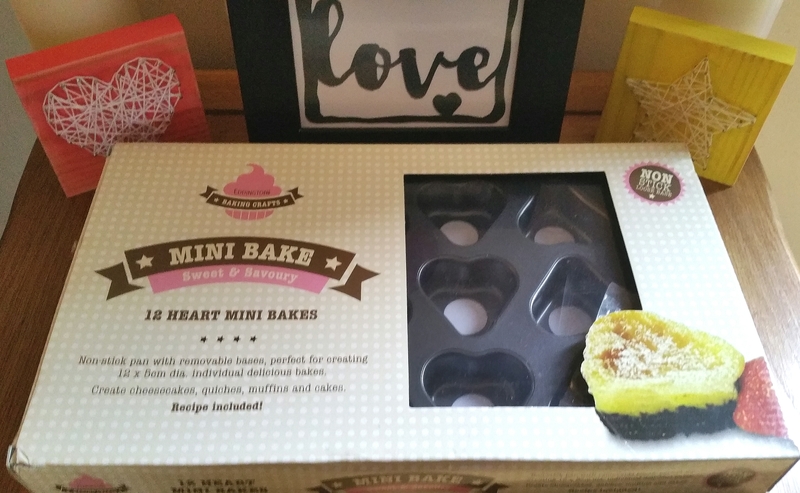 As you will know by now I am a HUGE fan of BakedIn, a wonderful company who produce baking kits so that anyone can bake scrumptious cakes at home. All of their kits contain the dry ingredients you need for the recipe already weighed out for you for convenience. Many of them also contain equipment you will need so that you can bake, even if you don’t own a cake tin! 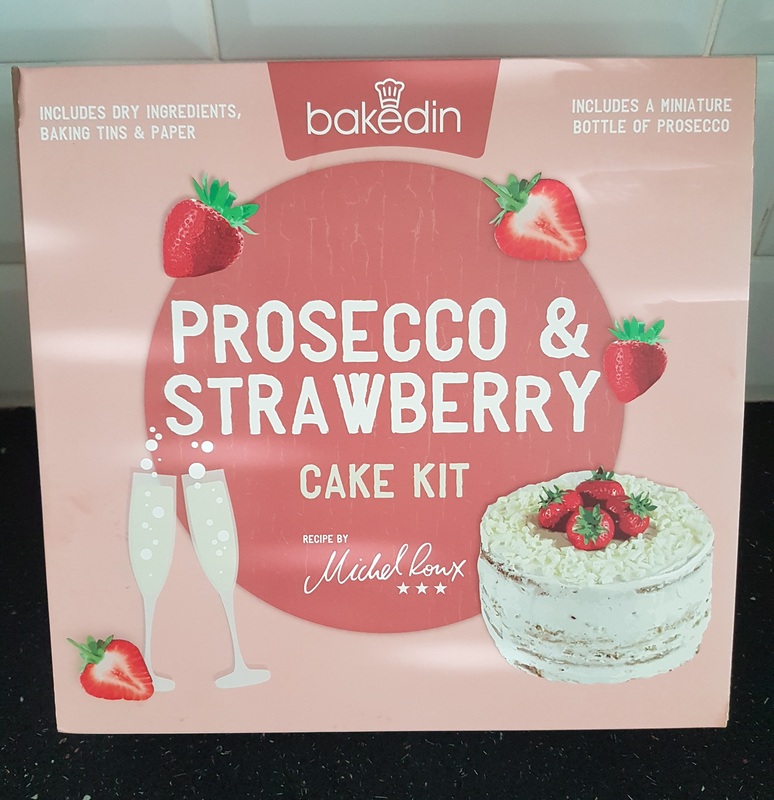 BakedIn are always coming up with new amazing recipes, and I was beyond excited when I saw they had introduced a new range of extra-indulgent cake kits with a bit of an alcohol theme. 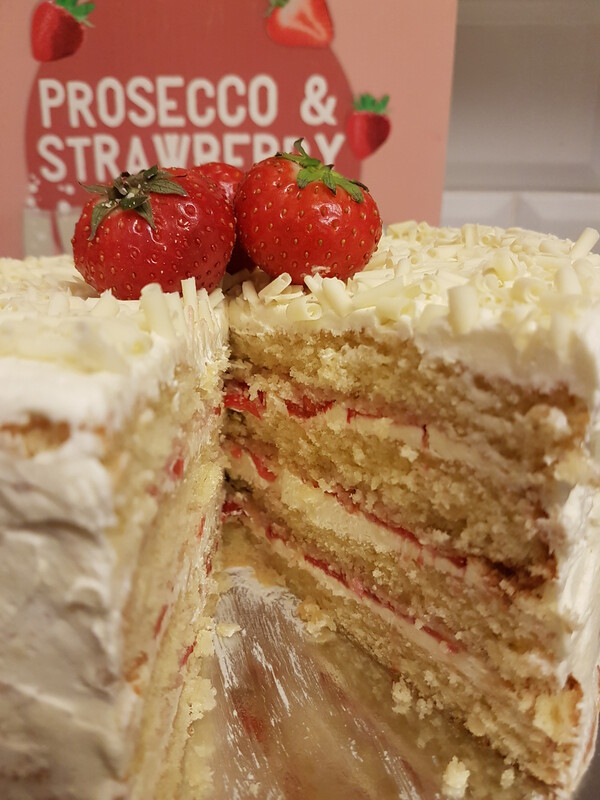 The first in the range is the sensational Prosecco and Strawberry Cake Kit. I knew I had to try this so rushed to order it straight away. It certainly won’t be the last time I order it either! 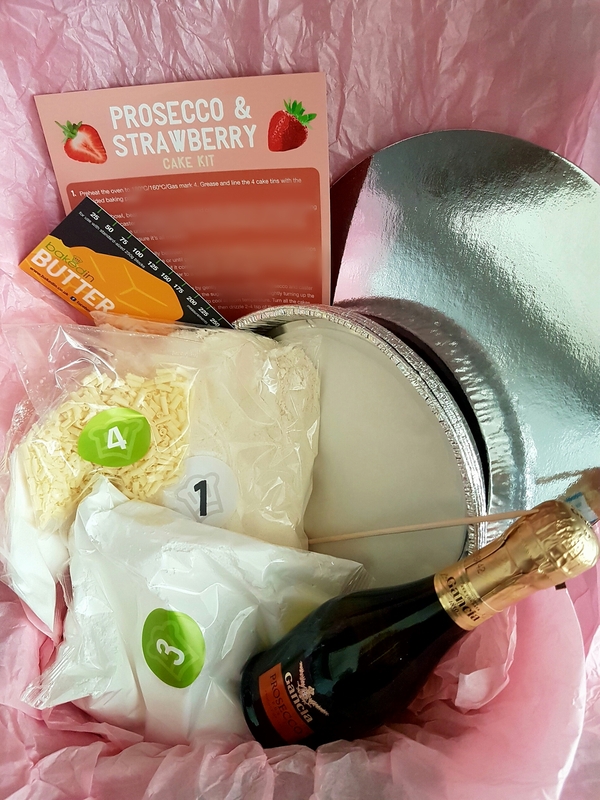 The kit comes complete with all the dry ingredients needed, a 200ml bottle of Prosecco (real prosecco… not just flavouring!!! ), 4 disposable cake tins with baking paper pre-cut for each tin, a skewer to test when the cakes are ready, a butter measure guide, a cake board to serve your cake on, and the recipe card telling you exactly how to make it, all wrapped up in pretty pink tissue paper. All you need to provide yourself is butter, eggs, a splash of milk, and fresh strawberries. 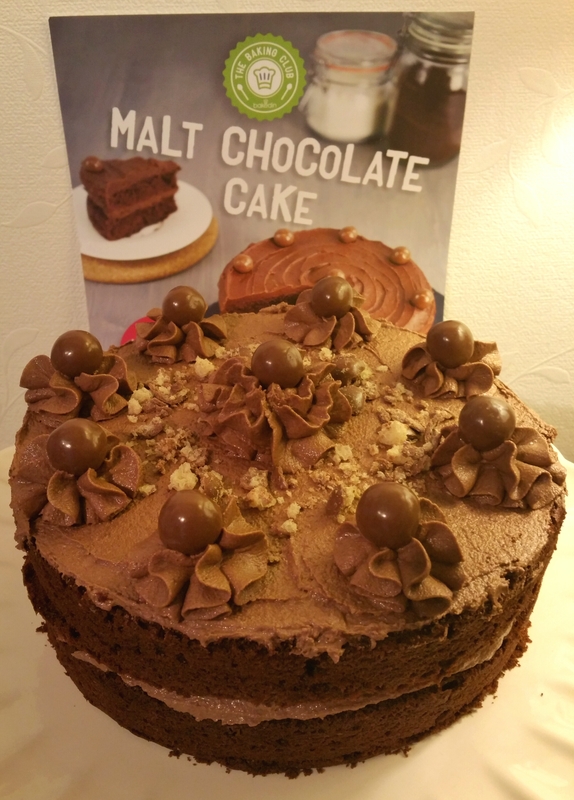 I’ve blurred out the recipe on the picture above in fairness to BakedIn. BakedIn cake kits are nothing like packet mixes, even though the dry ingredients are in packets. Packet mix cakes are often packed with added ingredients and preservatives to give them a long shelf life, and can result in artificial aftertastes. BakedIn kits are purely the dry ingredients needed, such as flour or sugar. Sometimes if a stage of the recipe requires 3 dry ingredients to be added together, BakedIn weighs them and packs them together for convenience. Nothing extra is added though. They use only top quality ingredients, such as locally produced flour, and finest Belgian chocolate. Packet mixes often just tell you to stir in some oil or an egg and the mix is ready to bake. To me, that is nothing like proper baking. BakedIn kits have a recipe to follow and the methods are just like ones you would see in recipe books. This makes them great for anyone with a love of baking already, or who wants to learn how to bake. Naked cakes (cakes which are left uncovered rather than iced) are very on-trend right now with their classy elegant appearance. Even more beautiful though, in my opinion, are the semi-naked cakes… cakes which have a very thin coating of buttercream which lets the sponge still show through. The Prosecco and Strawberry Cake is a semi-naked cake, a stunning showstopper. This cake consists of 4 layers of delicious vanilla sponge, each drizzled with prosecco syrup, which you make using the ingredients provided. 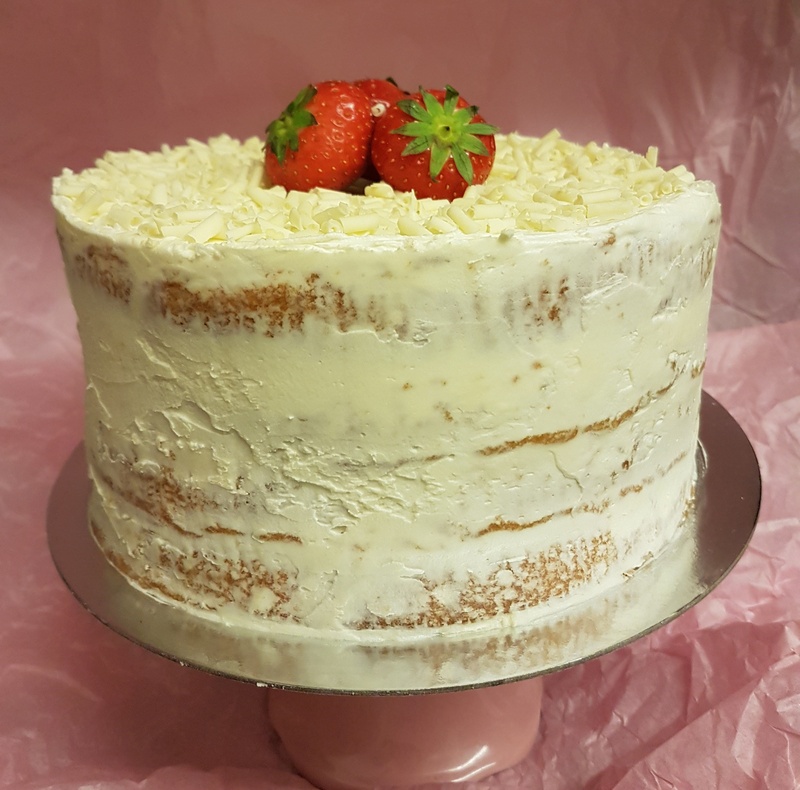 The layers are sandwiched together with fresh strawberries and prosecco buttercream, and the whole cake is topped with another layer of the buttercream and covered in white chocolate curls, with strawberries for decoration. It tastes absolutely heavenly. My Other Half even went so far as to say it was the nicest cake he had ever eaten, and he has eaten a lot of cakes! I have to agree though, it is pure indulgence. The sponge is soft and light, the buttercream is fluffy and creamy, and the prosecco taste takes it to another level. The combination of prosecco and strawberries is a winner! This cake would make a perfect alternative to traditional Christmas cake. I am going to get another one for the Christmas period. It would be ideal for New Year’s Eve celebrations too. In fact it would be perfect for ANY celebration or occasion! It would also make a fantastic gift to give to someone, and they would be extremely lucky to receive it!!! 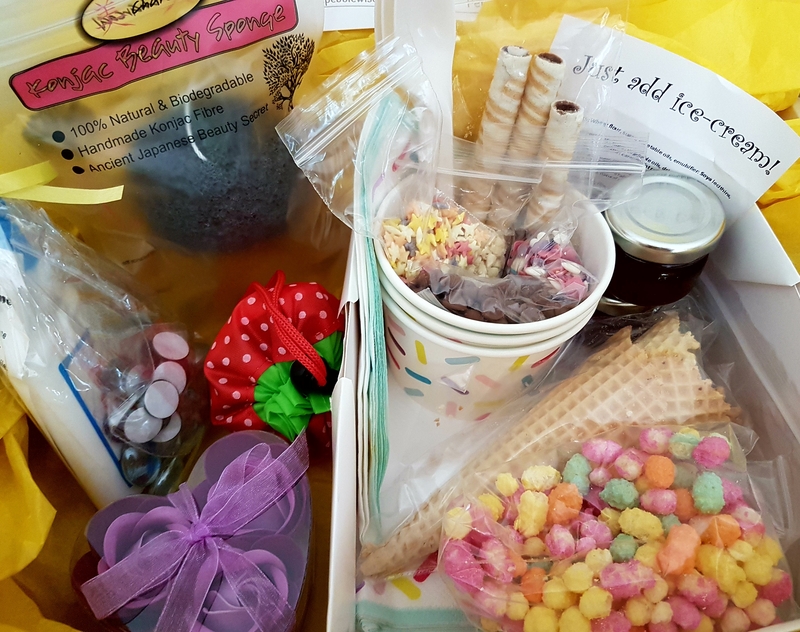 Bring Me Sunshine – With a Sunshine Box! I had seen posts from Pebblewise on Twitter about this box. It was set up to send to people who suffer from anxiety and/or depression, as a way of lifting spirits. I thought that was such a lovely idea. It was a Twitter friend’s birthday recently and she writes about mental health issues, being an anxiety sufferer herself. I decided to send her a Sunshine Box as a birthday present. Her reaction upon receiving it told me that this was a very special box indeed! I decided I wanted to experience the joy it brought her myself, so I placed my order for August’s box. On average you receive 5 items: 2 beautiful practical items, one luxurious self-care item, and 2 tasty treats. This may change from time to time though. We so often spend so much time looking after other people that we forget to look after ourselves, so this box is ideal to treat yourself. It also makes a beautiful gift to let someone know you are thinking of them. Sunshine Boxes get posted out on the 3rd of each month. On the 5th, it arrived. The box was bigger than I was expecting. This is definitely not a box that fits through your letterbox. Luke, my son, was just as excited as I was to see what was inside. I opened the box and the packaging inside instantly made me feel happy. Each item was beautifully wrapped in bright sunshine yellow tissue paper, so it was like a birthday with presents to open! 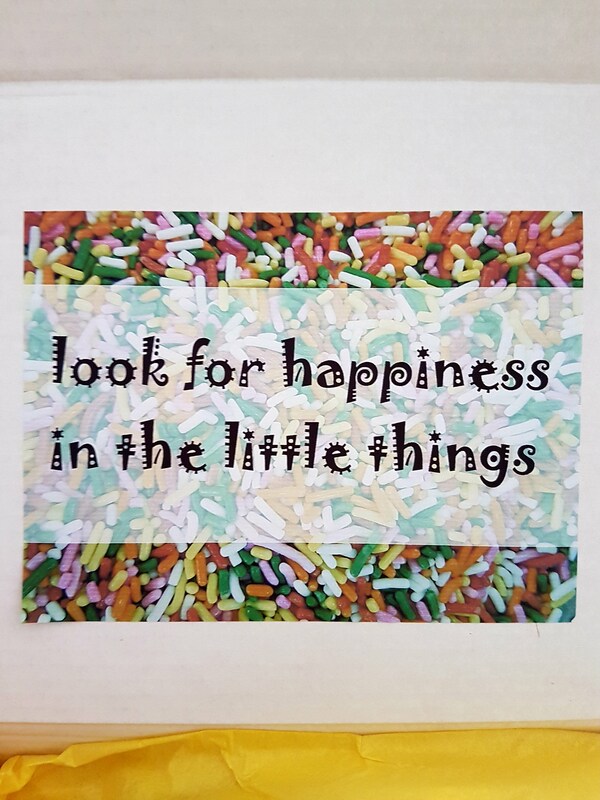 Each month a different positive-thinking poster is stuck on the inside of the box, and August’s was “look for happiness in the little things” on a background of sprinkles. Sprinkles always make me smile. They bring with them thoughts of cakes and ice cream. Ah, happy thoughts. The part that made Luke happiest was the box of treats to make your perfect ice cream. There was everything you could imagine for a scrumptious ice cream dessert, apart from the actual ice cream of course! That would have been a bit of a postal disaster! What was included though was gorgeous. 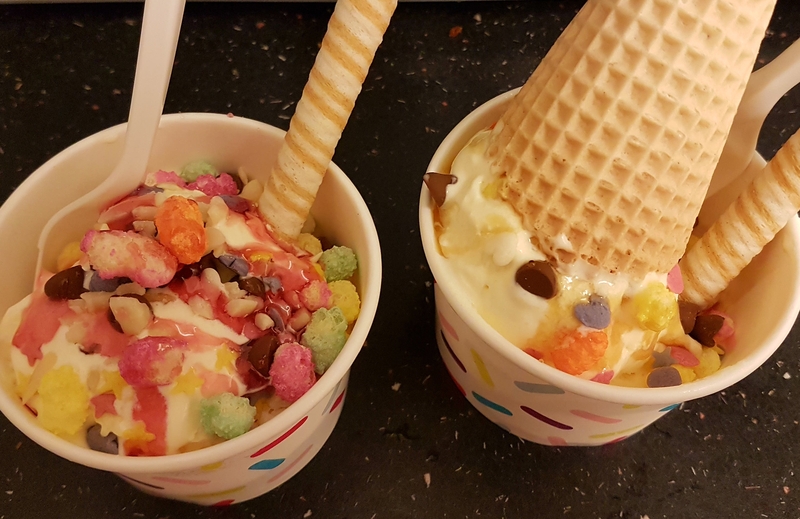 There were 3 ice cream bowls and 3 napkins with sprinkles on, 3 spoons, 3 ice cream cones, strawberry syrup, maple syrup, chocolate chips, chopped nuts, 2 packets of sprinkles, 3 wafer rolls, and a packet of rainbow drops. 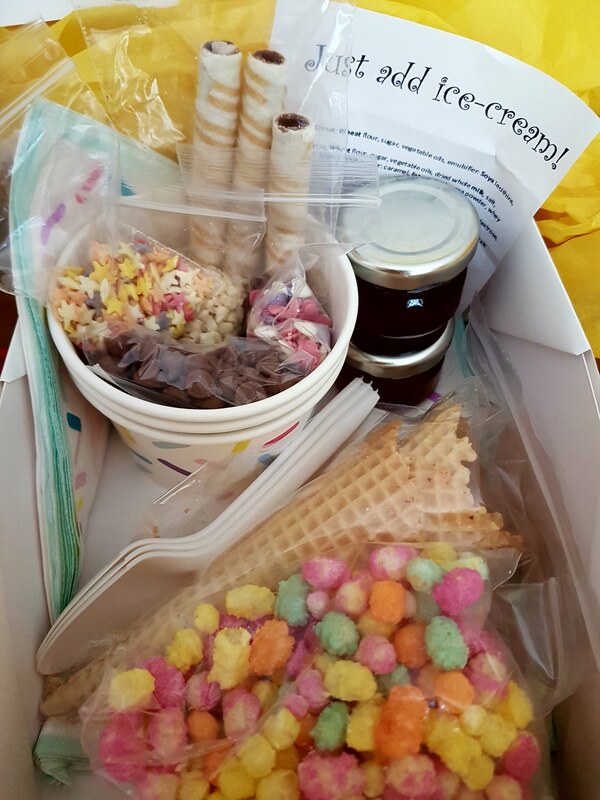 Luke was really excited to make us a yummy ice cream treat, and he put a bit of everything on them! I hadn’t had rainbow drops since I was a child, and I’d forgotten how much I used to love them. The activity of making the ice creams really made Luke happy, and this made me happy to see. He wants ice cream like this all the time now! The rainbow drops started a lovely conversation off about things from my childhood too. It all just made a wonderful evening. Also included was a set of 3 beautiful rose shaped soaps. These are so pretty and delicate. It’s hard to believe they are soaps. Absolutely beautiful. There was also a strawberry. But not just any strawberry! This one had a clever practical hidden secret. Open it out and it becomes a wonderful shopping bag! I shall keep this in my handbag at all times. So often I go out and buy something on a whim, but then have to buy a bag for it as I hadn’t expected to need one. 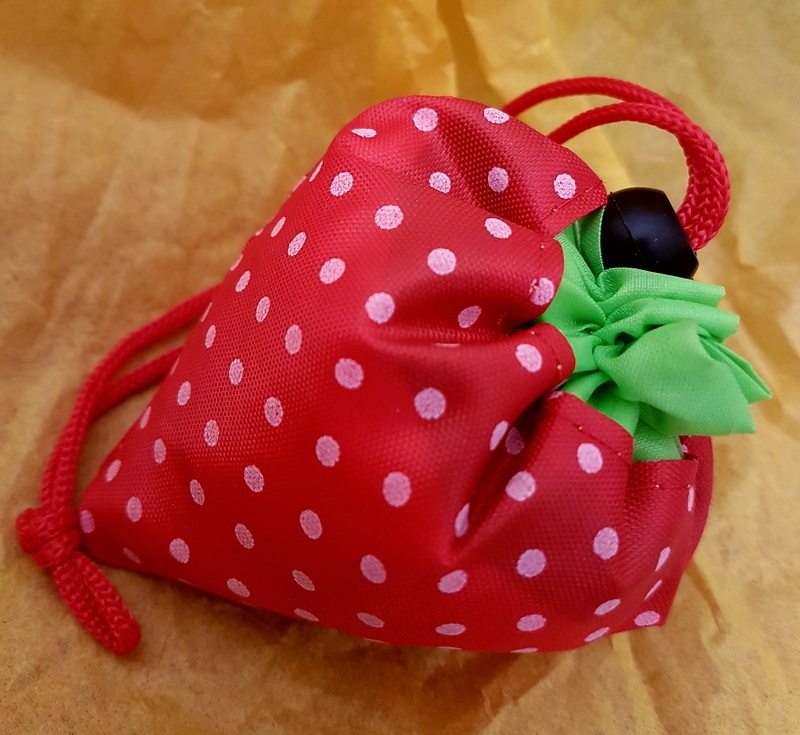 Now I can just use my strawberry! It is small enough to hardly take up any space, so just perfect. 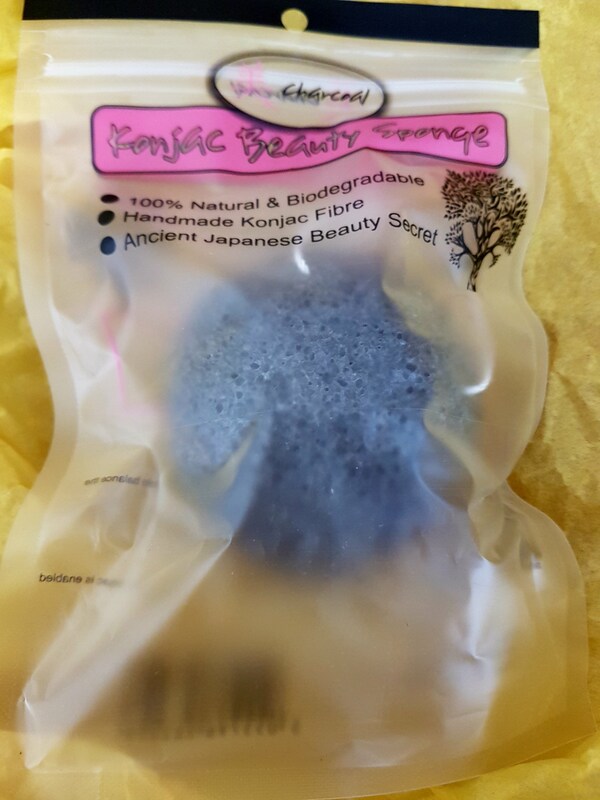 Next was a Konjac Beauty Sponge. I must admit I had never heard of these before. The packet says it is an ancient Japanese beauty secret. You just need to wet it so it expands and softens, and then massage your face with it. It is supposed to exfoliate, cleanse and moisturise your skin without the need for any soaps. It balances the PH of your skin and is said to be effective against acne-causing bacteria. Must admit, I love it and will be buying another when this one needs replacing in around 2 months. Finally there was a wonderful little activity to do either on your own or with your family. 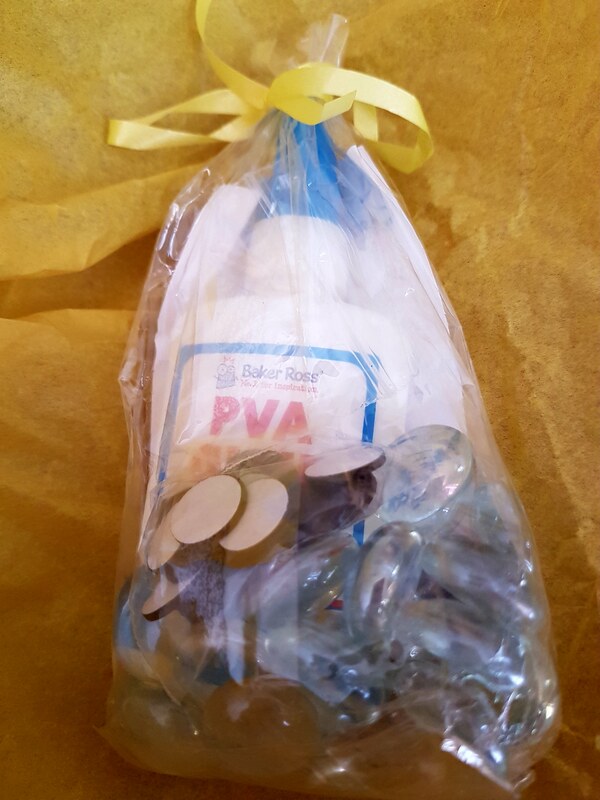 There was a package which contained glue, magnets and glass pebbles. The idea is to look through magazines, brochures, photos, wrapping paper etc and find small pictures or a word that inspires you, and cut them out. Stick them on the back of the glass pebbles, then add the magnet. They look fantastic when they are made! Luke loved making these with me. We are keeping some and using some as token gifts and geocaching swaps. I was hugely impressed with the Sunshine Box. Everything from the packaging to the contents just boosted my mood. It was lovely to have things I could enjoy with Luke too. 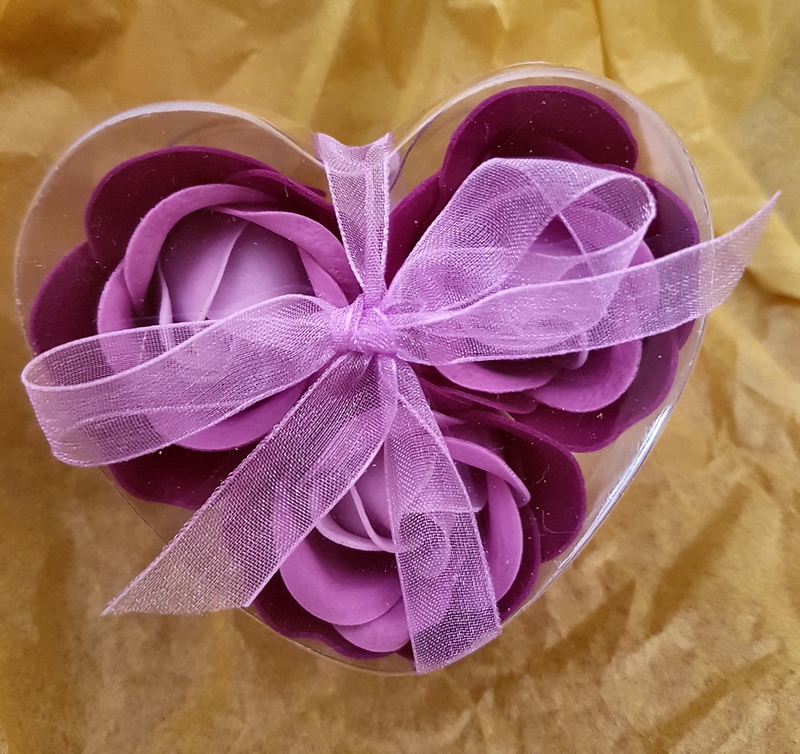 It would make a fantastic gift for a new parent who may be feeling tired and super busy all the time, or a baby shower gift so that mum-to-be can have something wonderful to help her through the exhausting preparation time for a new baby. Obviously it would be a wonderful gift for any other occasion too. You can order a one-off box or start a monthly subscription. Either way costs just £15 a month with free postage in the UK. This one cannot be sent internationally, unlike Wise Reads. EDIT 12/09/2018: Unfortunately, Sunshine Box has now closed down. 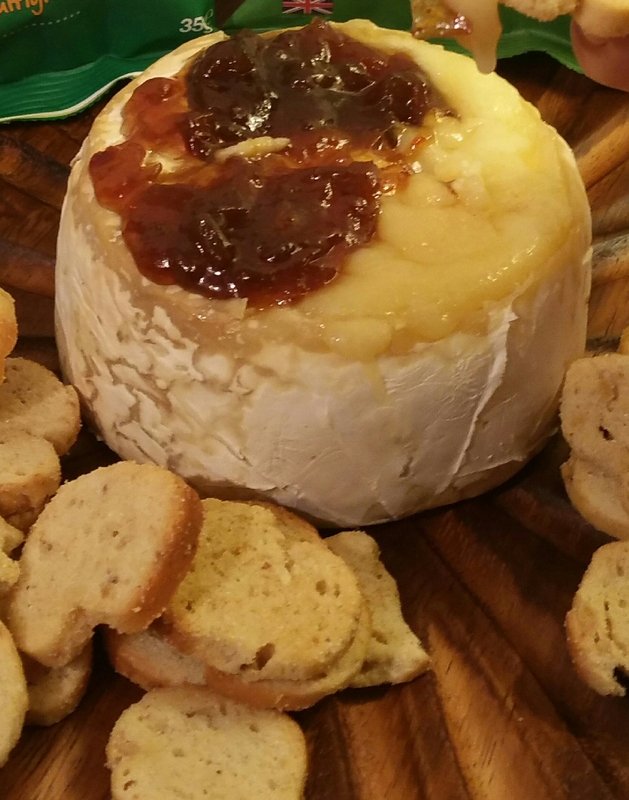 The Pong Cheese Club… Artisan Cheese Subscription Box! As you all know, I love subscription boxes. You know when you sign up to one what type of thing you will receive in your box, but you never know exactly what the products will be. As a lover of surprises, this appeals to me. The lovely people at Pong Cheese contacted me asking if I would like to try their brand new artisan cheese box. I do love cheese so jumped at the chance! I can honestly say I was massively impressed by it all too. Pong Cheese Club really puts the customer/recipient first. Most people like at least one kind of cheese, but some people really don’t like some types of cheese too. I have tried many times to like blue cheeses but I just don’t and never will. Pong Cheese lets you tell them your preferences, such as no blue cheese (which is what I said), no goat’s cheese, vegetarian cheese only… they really do cater the box to each individual customer. I love this detail. It guarantees you will only receive cheeses that you will enjoy. Boxes are delivered by courier on Thursdays, making sure your fridge is well-stocked for the weekend ahead. Delivery is free and the cheeses are brilliantly packed in a lovely box with ice packs to ensure they are fresh and in prime condition. The ice packs in mine were still frozen solid so the cheese was lovely and cold. Pong Cheese understands that you will be excited to receive your first box quickly, so it is delivered on the Thursday after you place your order. Subsequent boxes are then delivered on the Thursday after that date in the next month. You can choose whether you want to receive a box monthly, bi-monthly, or quarterly and you can pause or cancel your subscription at any time. There are 2 options available. 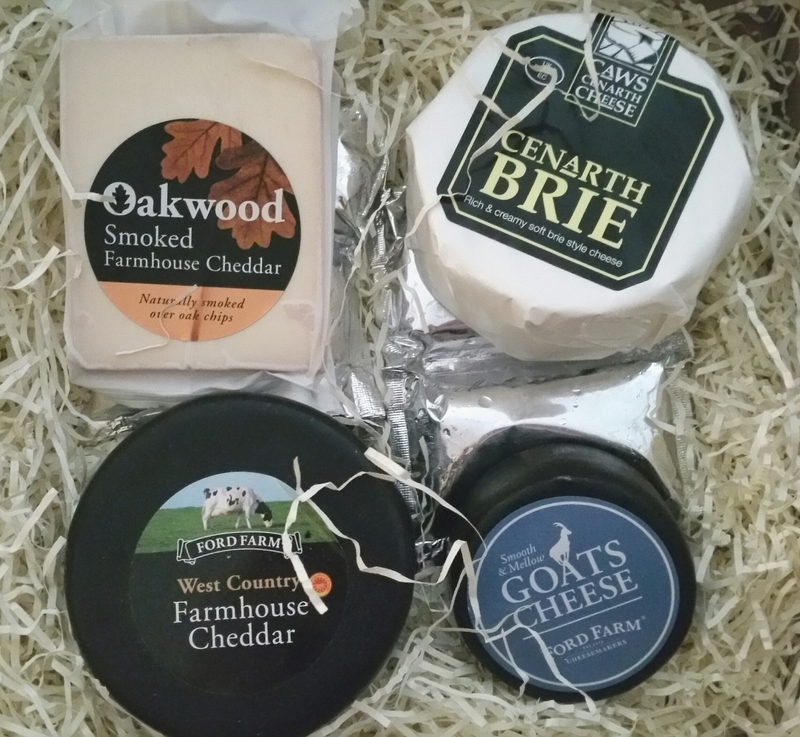 You can receive the regular box, which contains expertly selected seasonal cheeses from artisan producers. This is £22 per month including free courier delivery. The box I received was an example of this. Or you can choose to go Premium for £29 per month including delivery, and this option means you will receive at least one extra special cheese in addition to the others. As this is a brand new club though, Pong Cheese are very generously offering a 50% discount on your first box! More about that at the end. So what did I receive in my box? I had Oakwood Smoked Farmhouse Cheddar, Ford Farm West Country Farmhouse Cheddar, Caws Cenarth Brie, and Ford Farm Goat’s Cheese. The Goat’s cheese was delicious with a rocket, spinach and beetroot salad. It had a lovely smooth, creamy taste compared to the bitterness of the rocket leaves. My 10 year old son absolutely loves cheese, but he likes extra mature Cheddar. The stronger tasting, the better. He finds supermarket cheeses just too bland for his taste. (This is the only food item he has mature tastes in, by the way)! When I opened the Ford Farm Farmhouse Cheddar, he was at my side in an instant. This cheese (like the goat’s cheese) was surrounded by a wax covering, which my son thought was brilliant. He said it showed it was quality. I didn’t get chance to use much of this one in recipes, as he loved it cut into wedges and eaten on it’s own. This was my favourite too. Tangy but also creamy tasting. Sharp but also smooth. It was a taste sensation like no other. The Oakwood Smoked Farmhouse Cheddar was also enjoyed largely on it’s own, and on thick crusty bread with ham. Another delicious cheese, not as sharp as the Ford Farm but still packed with flavour. At the same time as receiving the cheeses, I had also received some bread crackers to try. A perfectly timed coincidence! I decided to bake the Brie to use as a cheesy dip for the crackers. I added a dollop of caramelised onion chutney which a friend had made, and it was heavenly! Gooey and silky and just delicious. Pong Cheese goes all out to make sure you enjoy the cheeses at their best, so they include a very informative guide on how to store and eat them. There’s a handy tip about which drinks go best with the different types of cheese. I learnt a lot from this guide. Did you know cheese should be served at room temperature for optimum flavour? I didn’t! I’ve always eaten it straight from the fridge! Not any more though. It really does make a difference. This subscription box is perfect for any cheese lover, and would make a lovely gift. As I said before, the wonderful people at Pong Cheese are offering your first box for half price at the moment! To take advantage of their offer just click HERE to go to the website, make your preferences and enter code CLUB50 at the checkout. At just £11 after the discount, and free delivery, it really is a fantastic bargain! Definitely well worth trying. DISCLAIMER: I received a sample box in exchange for an honest review. This in no way effects my opinions on it. My blog is based on honesty… I only recommend things I really genuinely like and would recommend. 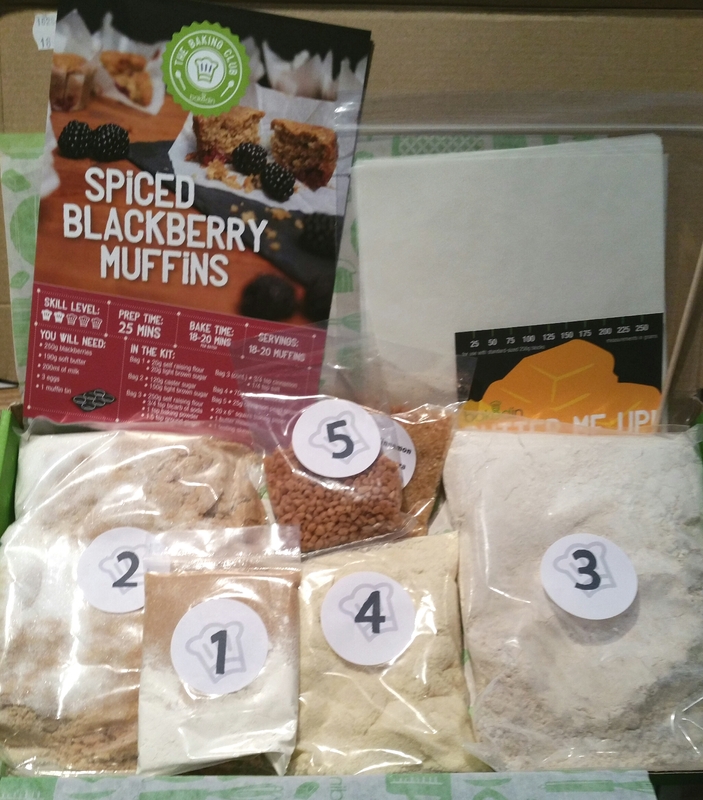 I really look forward to my BakedIn Baking Club box arriving each month. The chance to bake something delicious using a recipe created exclusively by Michel Roux for BakedIn is just so exciting, and I love the anticipation of what each recipe might be. 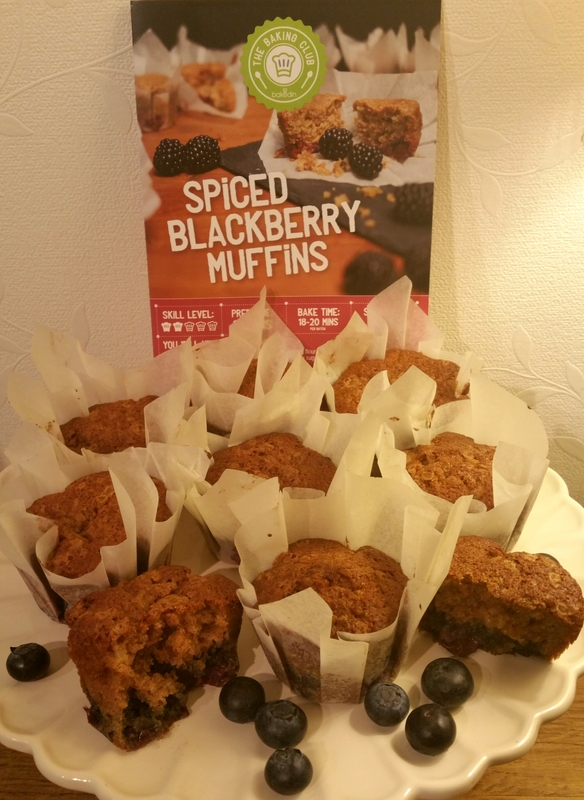 The October box was a beautiful Spiced Blackberry Muffin recipe. The eagle-eyed readers amongst you will have noticed I used blueberries instead. Here’s why. I had gone with a friend and my son to pick some blackberries not long before this kit arrived, and had found a perfect place with an abundance of big juicy berries. As we were about to start picking them though, an elderly gentleman approached us and told us we should leave them. We thought he was joking but it quickly became apparent he wasn’t, as he proceeded to go on and on about how they were food for the birds. We did tell him there were more than enough for the birds and for us and if we didn’t pick some they’d just go rotten there were so many, but he just wouldn’t leave us alone, saying “Birds can’t go to Tesco”. He was so rude and his manner was so unfriendly, he was actually making us feel very uncomfortable, so we decided to abandon our berry picking. I went to Tesco to buy some the next day, only to find they weren’t selling them any more! I searched for any bushes locally as the perfect place we had found was miles away on a nice day out, but sadly the berries had all gone. Luckily the helpful BakedIn team told me that this recipe would work with blueberries too, so that is what I had to use. I will be making these again next year though as soon as I spot ripe blackberries around! The Baking Club kit arrived as always in a box that fits perfectly through the letterbox. It contained all the dry ingredients needed for the recipe, already weighed out and placed in numbered packages to make following the recipe card simple. 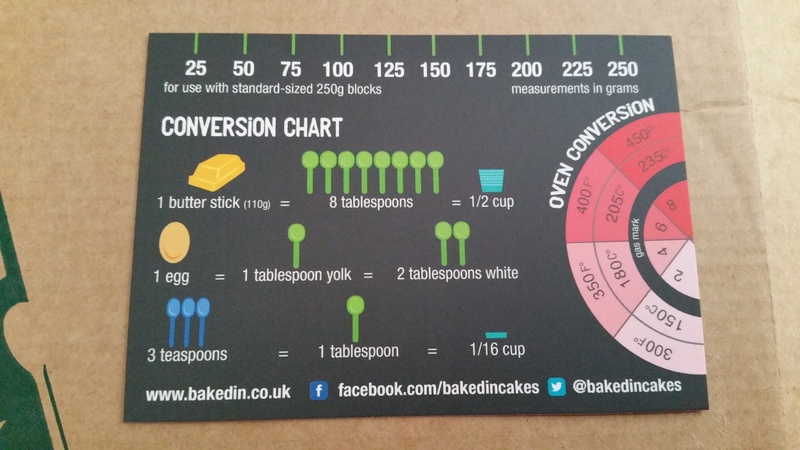 It also contained a handy butter measure guide, the recipe card, a skewer, and squares of baking paper. 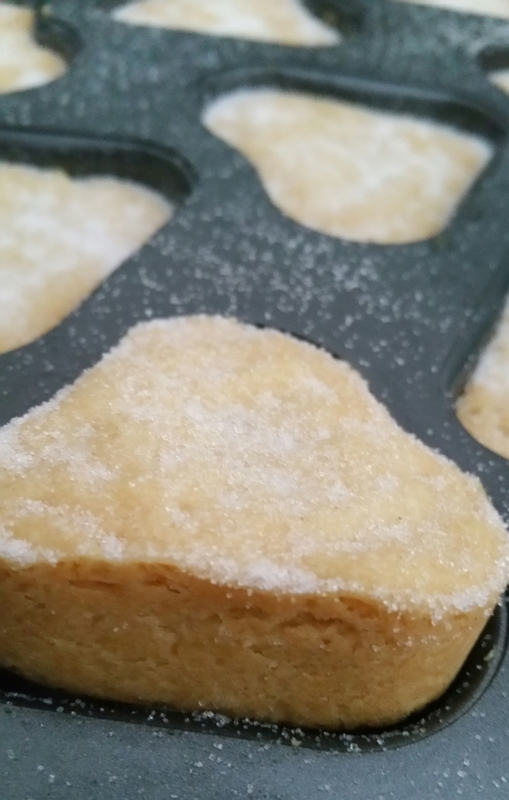 The baking paper squares were to make muffin cases out of, which I thought was wonderful. They ended up looking like the lovely tulip muffin cases you can buy, but were so easy to make! I just needed a glass that was the same width as the cups in my muffin tray, which I had, and then it was a simple task of folding the paper around the bottom of the glass. It didn’t take long at all to get them all made and placed in the trays ready for the mixture. The instructions were, as always, very clear and easy to follow. You really can’t go wrong with these kits. I would say they are completely foolproof. The kitchen had the most amazing aroma of cinnamon and almond while I was preparing and baking these. It felt very Autumnal and cosy. 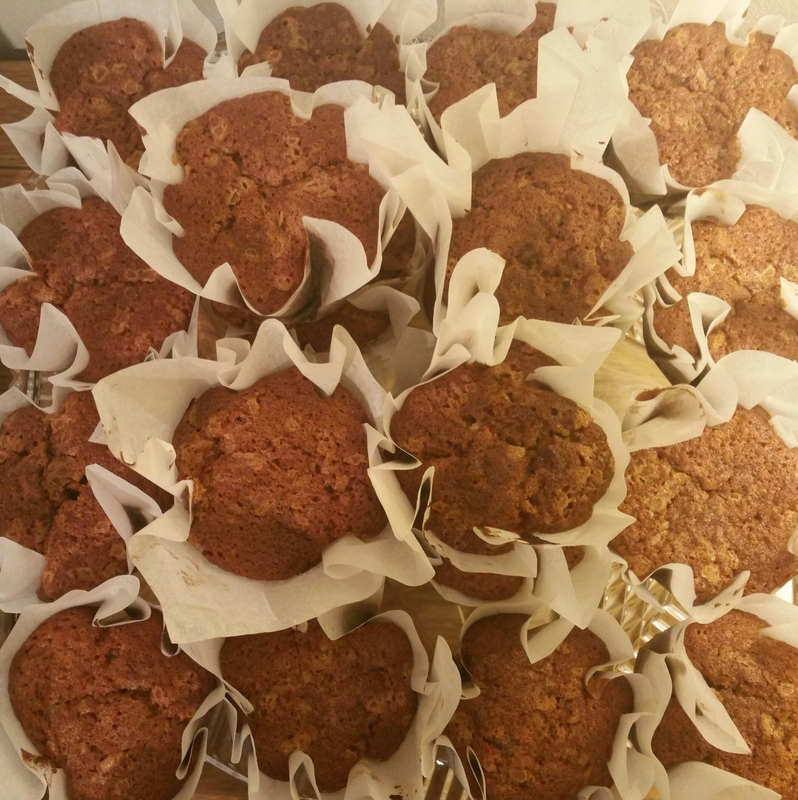 The recipe made 20 muffins, which was great as they were so delicious they disappeared rapidly! The addition of cinnamon pearl sugar on the top added a beautiful sweet and spicy crunch. They really were scrumptious! I don’t believe in giving much away about these recipes as they are exclusive to the Baking Club, but I can say in the months I’ve subscribed there hasn’t been a single recipe I haven’t loved. It is so easy to get stuck in a rut of just baking the same things for convenience, so this Club is a great way to try new bakes you might not otherwise have come across. 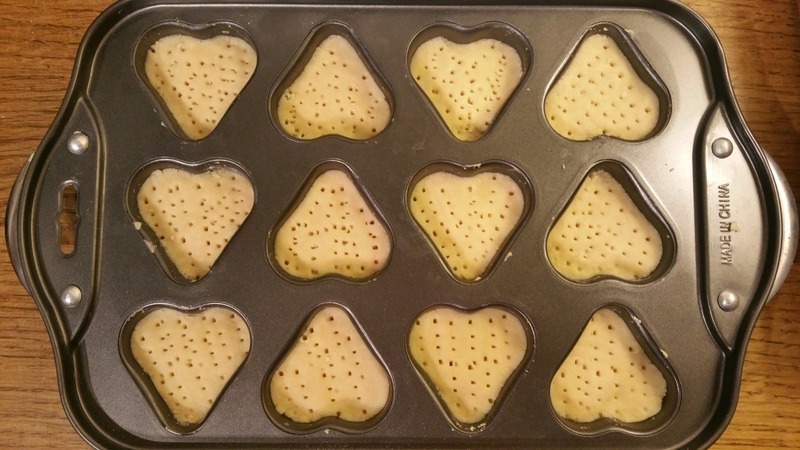 It is ideal too for those days when you really want to bake but time is short. The fact the ingredients are weighed out for you cuts out so much preparation time, so you can just get on with the fun part. I tend to do mine with my 9 year old son, as the recipe card is so easy to follow. A perfect way to spend quality time with your family, and a great way to bring everyone together to enjoy the end results! 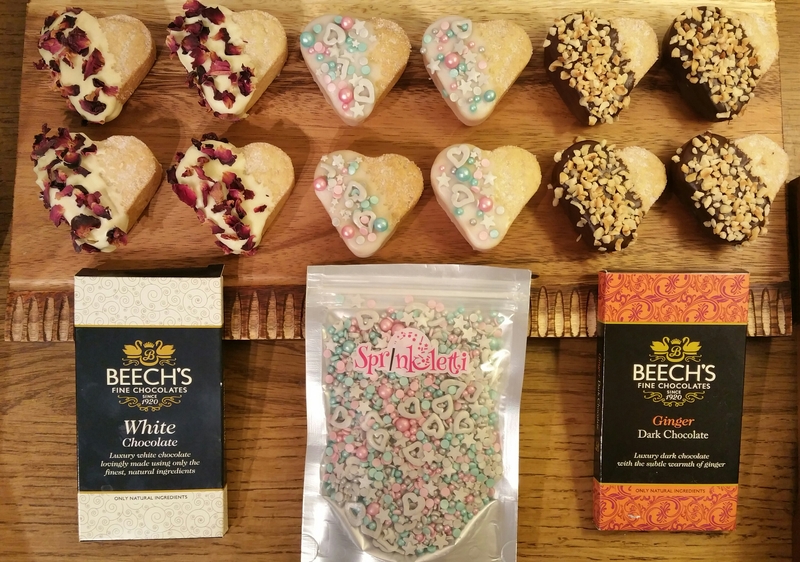 Christmas is fast approaching, and if there’s someone you are struggling to find a gift idea for, why not buy them a Baking Club subscription? It would make a beautiful gift for any occasion. How about a house warming present? 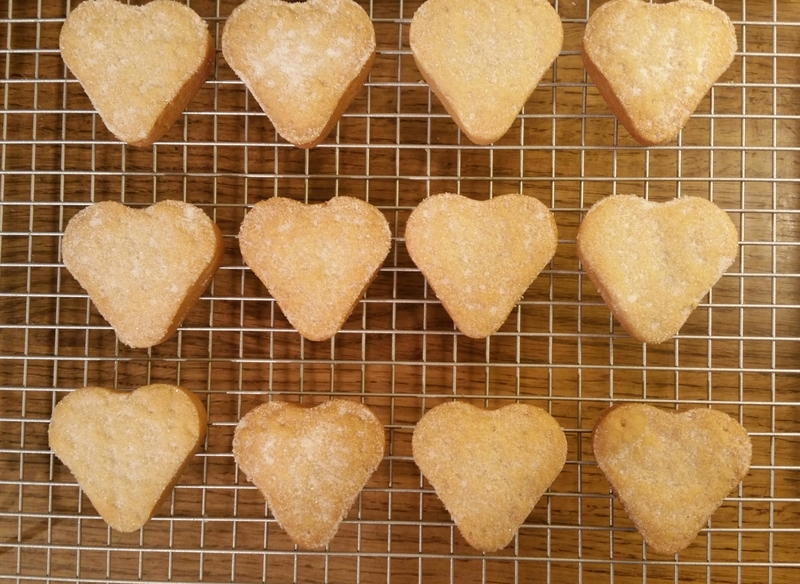 Give someone the smell of home baking to fill their house every month, along with a sense of pride and achievement when they have created something delicious. 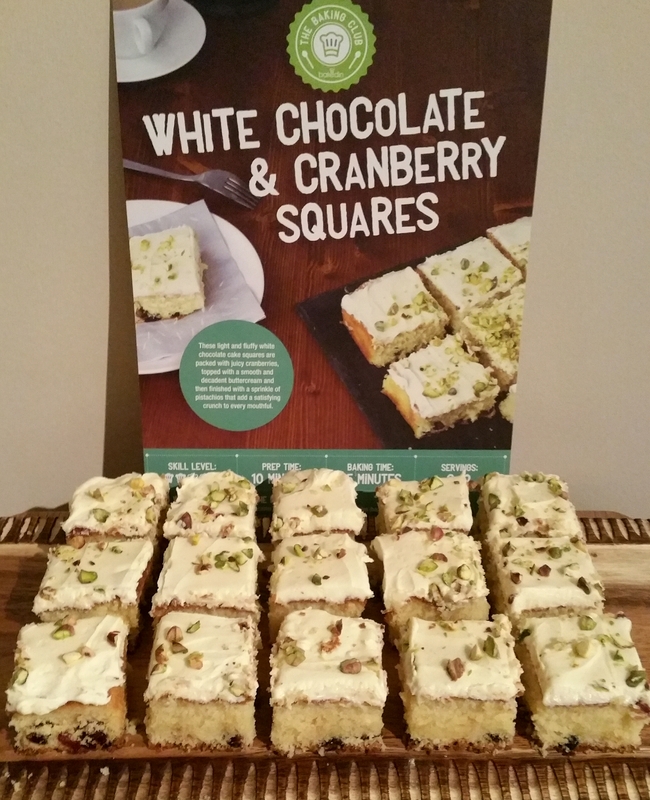 The Baking Club subscription costs £7.99 per month, including postage. That is already a fantastic price, but the lovely BakedIn team are so sure you will love their Club, they are letting you have your first box for the crazy price of just £1.99!!! You can cancel at any time should you want to (although I doubt you will). To get your first box for the ridiculously low price of £1.99, click HERE to join the Club using the discount code they will provide on that page. Happy Baking! 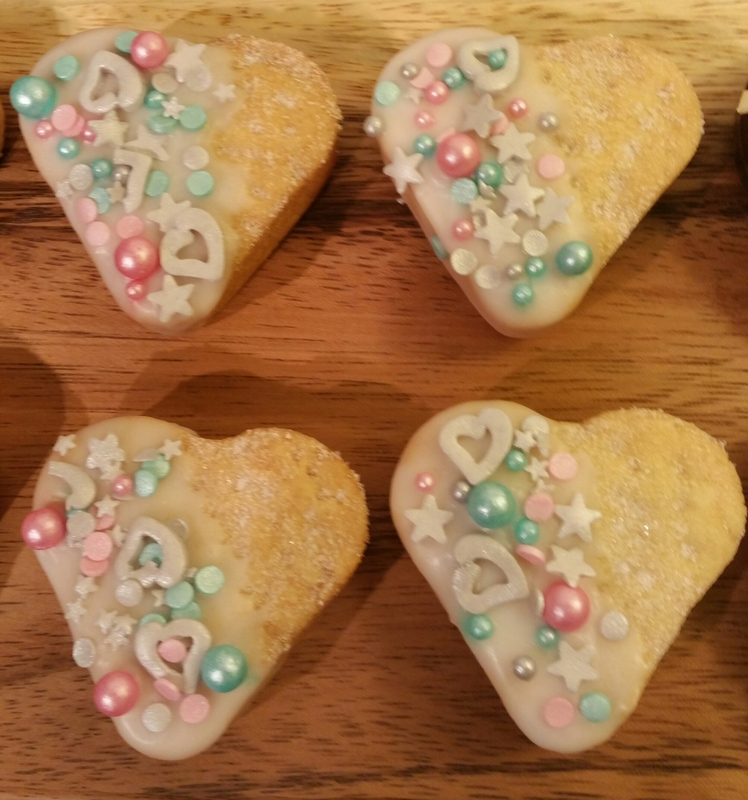 Bakedin Baking Club…. Featuring Exclusive Recipes from Michel Roux! August traditionally sees the start of a new series of The Great British Bake Off, and people up and down the country go baking bonkers! Everyone gets inspired to try their hand at new things, and everyone wants to be able to bake like the experts we all look up to. One such expert we aspire to follow is the wonderful Michel Roux, known and loved worldwide as a top pastry chef and the godfather of modern cuisine. 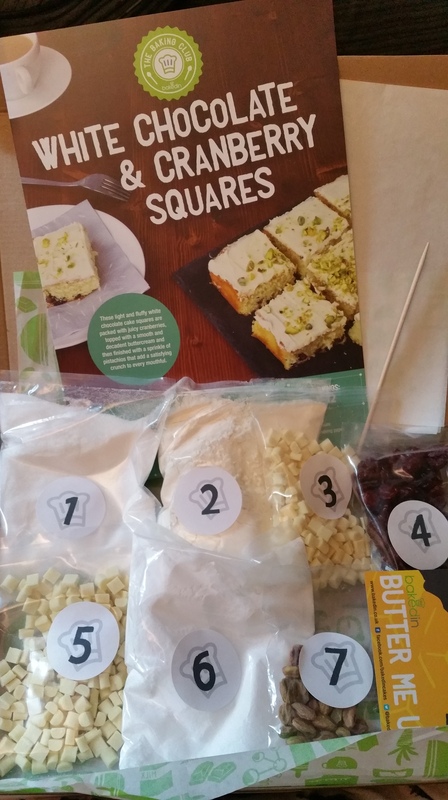 It came with the detailed recipe card, caster sugar, flour, baking powder, white chocolate, cranberries, icing sugar, pistachios, a butter measure, baking paper, and a cake test skewer. Each recipe card also features a top tip from Michel Roux to go with his recipe, often a little extra way of enhancing the recipe even more. I love the fact you have the exact amount of ingredients that you need. No need to worry about how to use up the rest of a bag of an ingredient you don’t tend to use much! I bake a lot at home but so far, each kit I have had has been for something I’ve never made before, which has been fantastic. 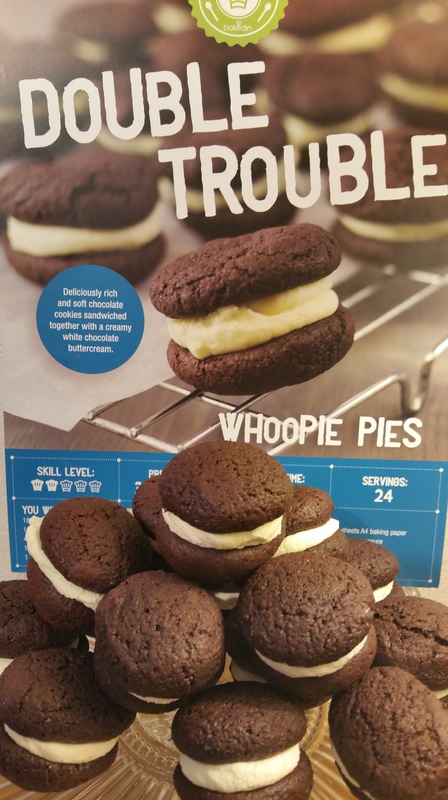 The first one was THESE WHOOPIE PIES, and the next one was a scrumptious malt chocolate cake (picture at the end of this post). I can honestly say though that I will be making all of these recipes again as they were so delicious. August’s recipe was the lightest fluffiest cake with the most beautiful flavour. It was a massive hit in my house and disappeared very quickly! These kits aren’t the same as using a packet mix, where you just add water or egg to one powder mix. These kits are still baking from scratch, the only difference being that most of the ingredients have been weighed for you, like having your very own kitchen assistant. You still have the huge sense of achievement when you complete the bake, and anybody can do it and get fantastic results! The fact that everything is labelled so clearly and the recipe has photographs of each stage makes these kits ideal to do with children. My 9 year old son looks forward to this box arriving just as much as I do! We love the surprise factor too, not knowing what yummy bake is lined up for us until we open the box. So, who is this subscription box suitable for? I would recommend it to everyone! 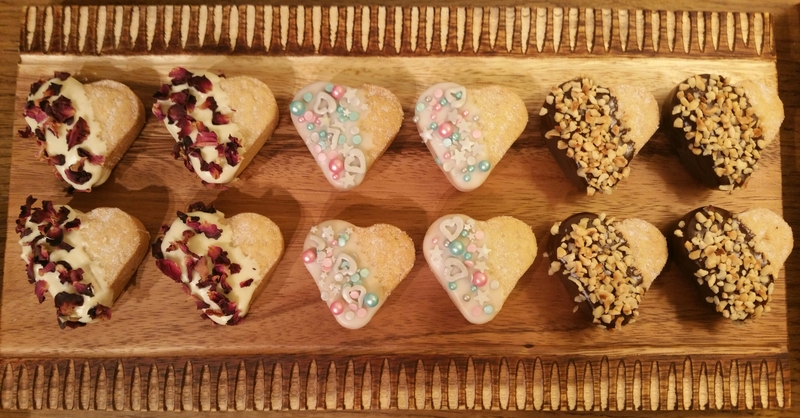 Parents wanting to spend quality time baking with their children, baking novices looking to learn some new skills and recipes, skilled bakers looking to further their recipe repertoire, and you can even buy a subscription as a gift for someone else. I love baking and have already learnt a lot from these kits. The way they tell you to melt chocolate in these recipes is brilliant! I’m not going to give that tip away on here, but it really does save a lot of mess and washing up and makes the potential of ruining the chocolate impossible, unlike other methods people use. The Bakedin Baking Club costs just £7.99 a month, including delivery. That is an amazing price considering how much you get, including Michel Roux’s expertise! DISCLAIMER: I pay full price for my subscription and have not been asked to write a review. I truly love this Baking Club though and I believe in sharing information about companies/products/services I enjoy. Sharing is caring after all! All opinions expressed are my own. The link provided is part of Bakedin’s Referral programme, which anyone can take part in when they join too. Last week I decided to join the BakedIn Baking Club, which is a monthly subscription box which helps you make scrumptious recipes created by the one and only Michel Roux. In the extremely unlikely event that you don’t know who that is, Michel is a world-famous pastry chef who is also known as the godfather of restaurant cuisine. That is one of the reasons I decided to try this box out. Michel Roux developed the recipes!!! When you join this Club, every month you receive a box containing all the dry ingredients you need to make the recipe. Obviously things like eggs are hard to send in the post so you will need to provide a couple of basic ingredients yourself, namely chilled or liquid ingredients. Everything is weighed out for you so you don’t have to mess around weighing out lots of different things, and each ingredient is packed in a bag with a number on. The recipe card tells you what is in each numbered bag so you really can’t go wrong. One of the things that impressed me was they even send the baking paper you will need. This box contained 6 sheets of baking paper to bake with and 2 grip seal bags which you could use as piping bags for the buttercream. Little details like that make me happy. Another thing I loved was the Butter Me Up butter measurement guide. 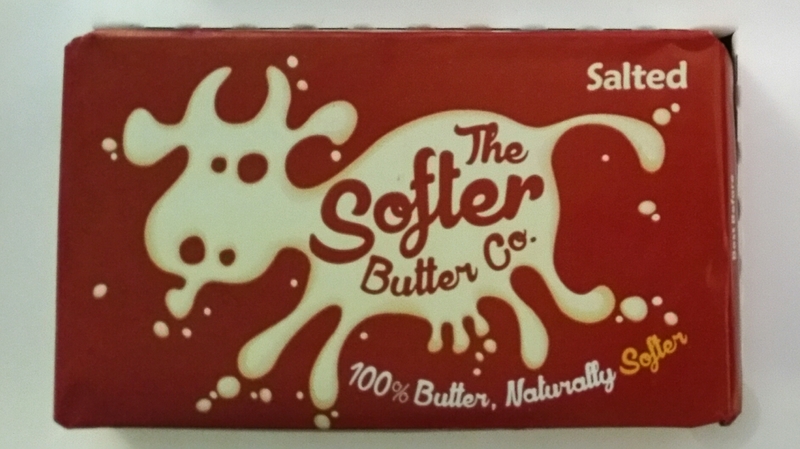 This card is to be used with standard 250g blocks of butter. When you position it next to the block, you can accurately measure out the correct weight of butter you need without having to weigh it! I tested this a few times and it was spot on. It also has a handy conversion guide on it. I shall be laminating this to make sure it stays in perfect condition. 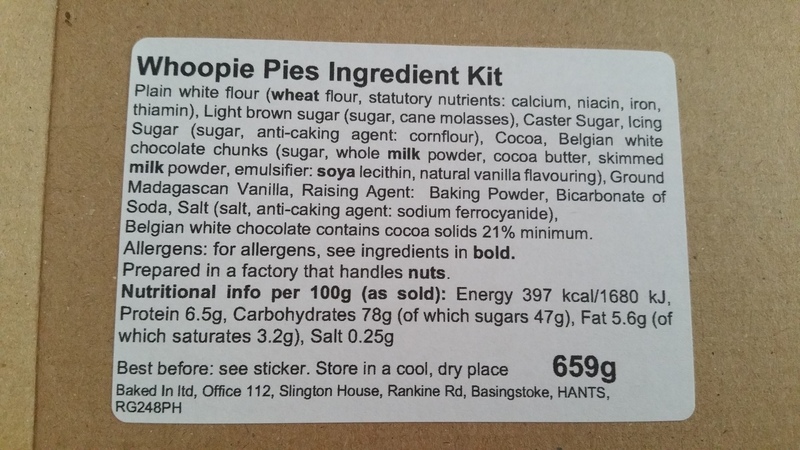 All of the ingredients are listed on the inside of the box, with allergens in bold as required by law. It even gives nutritional information! Another thing I love about this Club is the fact they send your first box out within a day or two. With most subscription boxes you sign up, but you have to wait weeks until the first box is delivered. BakedIn understand you will be excited to get started so, no matter when you join, they send your first box straight out. All of these little details make you feel valued as a member. 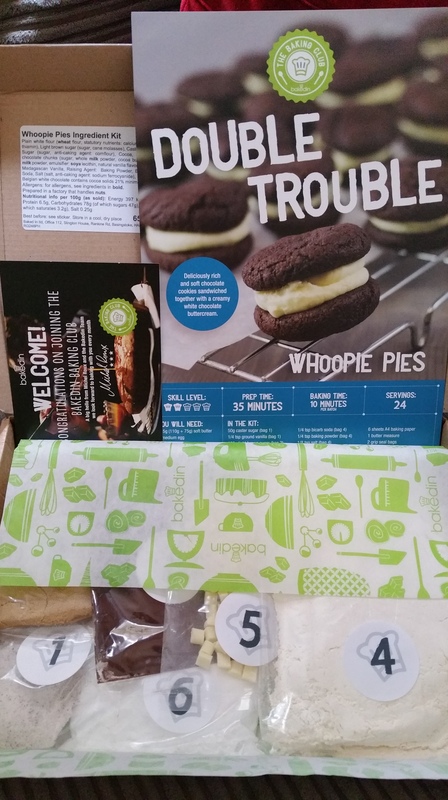 My first box was Double Trouble Whoopie Pies. I had never made, or even eaten, a whoopie pie before, and if it hadn’t been for this box I probably never would have! I now know I have been seriously missing out! If I’m honest I wasn’t even entirely sure exactly what they were. I’m hanging my head in shame. If you’re unsure like I was, I would say they are a cross between a soft cookie and a cake, sandwiched together with a delicious filling. In this case, they were beautifully chocolatey with an extra hit of chocolate in the white chocolate buttercream. They tasted sooooo good. My Other Half and my son both tried one, which very quickly led to another, and another. They are ridiculously moreish, and I can see me becoming addicted to them! The recipe card was extremely clear and easy to follow. It was a perfect way to involve my son too. He had fun finding the right pack and adding it to the mixture, and rolling the dough into ball shapes. He could really even have done this one on his own, the instructions were so well written. The card gives you baking times, preparation times, servings, skill level (this was 2 out of 5), and tells you what you will need, and what you have received in the box. There’s even a Top Tip section at the end of the recipe, written by Michel Roux. Am I going to continue with this subscription? Definitely! Would I recommend it to others? Again, definitely! It is perfect for all skill levels, for bakers and non-bakers alike. It would make a fantastic gift too. Imagine receiving this as a housewarming present! Freshly baked goods fill a home with a wonderful aroma and so this would be perfect. The smell of chocolate lingered in my house all day after baking these! BakedIn Baking Club costs £7.99 a month, and that includes delivery. This box cost the Club £2.57 to send. If you add on to that the cost of the packaging, then the ingredients and the little extras, and the fact you are receiving a recipe from a world famous pastry chef, I’m sure you’ll agree it is exceptional value for money. If you are interested in joining, click HERE to receive your first box for just £1.99 including delivery, saving you £6 off the usual price! You can cancel at any time, although once you’ve tried a box I doubt cancelling will even enter your head!! DISCLAIMER: I pay for my subscription and will continue to do so. If you join using my link though I will receive a bit of credit as part of their Referral programme, which you will also be able to take part in after you have joined should you choose to. All opinions expressed in this review are entirely my own, and BakedIn did not ask me to write this review.